It's been a long time since I've been this far on both sides of a movie. 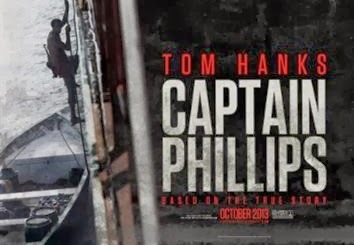 Captain Phillips is an incredibly well-made thriller based on an incredibly problematic premise. It's also one of this year's Oscar nominations for Best Picture and so far the weakest of the 7 I've seen. As with any film "based on a true story" it has a tenuous grasp on reality, and while I tend to try to ignore these discrepancies as long as they make for a good film, in this case they provide a clue to discovering the film's ideological underpinnings. It is directed by Paul Greengrass of The Bourne Supremacy and Ultimatum, and while it's probably the best work he's done so far, it was ultimately overshadowed by its regrettable political stance. Quick synopsis just so we're on the same page, no spoilers. Richard Phillips (Tom Hanks) is the captain of a cargo freighter assigned on a mission which takes it around to the Horn of Africa. 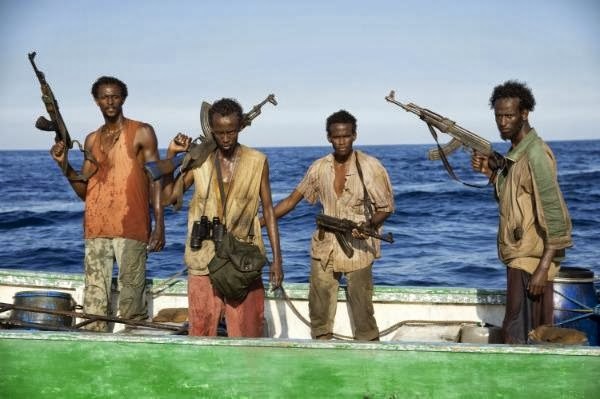 En route, his ship is attacked by Somali pirates led by a man named Muse (Barkhad Abdi) intent on... well they definitely want money, but their specific motivations beyond that are never really established. Fortunately the time we're given to ask questions is often limited by the intensity of the fast-paced narrative, and as strange as it may sound this is actually the highest merit on which I might recommend this movie. Captain Phillips is, if nothing else, a very tense thriller. Everything about the movie works towards this one goal: Greengrass's signature frenetic handheld cinematography, the (literally) high-strung orchestral soundtrack, the claustrophobic confines of the set design. But this tension is accomplished at the expense of character development, and we're barely given enough time to learn that Phillips is meticulous and/or exacting before he finds pirates aboard his boat. To some extent this shortcoming is compensated for by the quality acting (Tom Hanks is incredible especially during the final act), but I don't see it enduring as anything more than an entertaining, big-budget action movie. The fact that it earned 6 Oscar nominations including Best Picture is a little baffling to me since the only thing Oscar-worthy about it was Hanks's performance (for which he wasn't nominated) and maybe the sound mixing. It doesn't hold a candle to last year's Oscar-nominated, military-based action thriller Zero Dark Thirty, and it's not like this year was short on meritorious titles (Inside Llewyn Davis, Rush, August: Osage County, maybe even include a foreign film like last year). Captain Phillips feels like a summer blockbuster next to the other nominees. It's a fun movie, but it's not one of the best of the year. The real problem comes when you start to consider the film's politics. It is unabashedly about a heroic white man saving other slightly-less-heroic-but-still-commendable white men from greedy black men who are trying to take their things. Don't get me wrong, I think it's totally possible to make a film with a white protagonist and a black antagonist which avoids repugnant ideology and is even compelling or heartfelt. But one of the most important ingredients is making both sides sympathetic at some level, and it is never possible to sympathize with the pirates. The first shot of Muse pans down his gun which is hanging on the wall pointed at his head. The implication becomes clearer as the film progresses: this man is dangerous and perhaps even psychotic. And again, psychotics are fine but it's important to also show that they were once human, and we're not given any of Muse's back story. The closest we get is the information that his other profession (beyond being a pirate) is fishing, and even then the movie makes it his fault for not succeeding and falling back on piracy as an "easy" solution. There's no effort put in to show Muse's side of the story, to show what pushed him to piracy. There's a scene from The Birth of a Nation which is often shown to film students as an early example of parallel editing being used to build tension. It cross-cuts between shots of evil black soldiers attacking the innocent white Camerons and shots of the Ku Klux Klan riding to the Camerons' rescue. The scene is constructed so that you root for the KKK. The film was criticized as racist even when it was released in 1915, pressing director D. W. Griffith to make Intolerance the following year in response. What horrified me about Captain Phillips is that there are eerily similar scenes throughout it: the menacing black pirates are antagonizing Phillips and his crew while the US military hurries to the rescue. I mean, that's basically the entire plot of the movie. The racism isn't quite as obvious thanks to the absence of blackface and of the KKK, but the manipulation of the audience is just the same. White guys: good. Black guys: bad. The film has also been criticized for glorifying a man who may not have been so commendable. 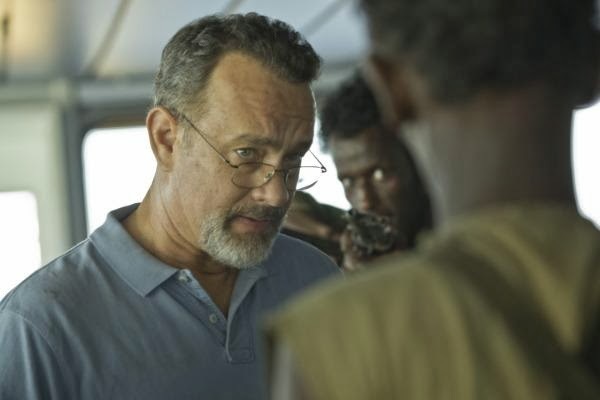 Whether the real life Captain Phillips was a good guy or not, the bigger point to be made is that the characters who really don't get a fair portrayal are the pirates. Sure they're pirates and maybe they deserve to be punished for that, but it's not like they come from a place where it's easy to live and they just chose a life of crime because it was convenient. Imagine how the message of the film would change if it included the trial of the pirates cross-cut with shots of the poverty in which they grew up. 80% of captured Somali pirates were born in the conflict-ridden southern regions of Somalia created by the ongoing civil war. They choose piracy because there aren't many other options. At the end of the day, Captain Phillips is a very well-constructed thriller, the last 10 minutes of which may reduce you to tears. If you ignore its ideological politics it's a fun movie. I just wish it looked critically at the issues it portrays. You're right about the lack of backstory. Both the pirates and Captain Phillips. That's why I purchased the book. I think the movie is just meant to be a thrill-ride and maybe not exactly a biopic. For that reason, it's easier to just consider the pirates as assholes who are doing this selfish thing. I honestly didn't care who they were or where they came from - they shouldn't hijack a cargo ship delivering stuff for charities! So I have a simple view in the end, and I guess the movie dumbed things down (appropriately) and the pirates don't deserve any concessions. I don't think that's truly racist of the filmmakers - the pirates were the ones pointing the guns at the white captain. But I don't blame you for wanting something a little more, but at least you got a good article out of watching it! As you know, I loved the film, but maybe the book will answer some remaining questions. Thanks for a different opinion and for sharing. When I finally saw the movie my thought process was basically this. Why does America always have to fight against a non-white other? Because it's based on a real life event. So if it's based on real life, how accurate is it? Well, they changed a lot of stuff to make it more exciting and to make Phillips more of a Hollywood Hero. So then why do the pirates have to be black? And I couldn't find an adequate answer to that question. Sure, piracy off the Somali coast is an actual problem in the world today, but they don't show both sides of it. They use real world problems as an excuse to give prosperous white men more bad guys to fight. I don't know, I just couldn't stand to watch it. As usual I'm probably making mountains out of molehills (I even called Lincoln racist last year) but you know, to each their own I guess. I feel that the movie does try to make some gestures towards the pirates, showing capitalism as a system that forces both them and Phillips out the work they do. Problem is that the film foregrounds that conversation in the opening scene (which is terrible) and then doesn't really have anything to say about it. I didn't find the politics of the film particularly problematic, except insofar as it adds to the pile of movies showing white heroes vs. impoverished dark-skinned criminals (which is a problem more with the system than it is with this one particular film). Biggest issue for me actually is that the film really doesn't have that much of a perspective on the events at hand, other than "This happened." Greengrass's ultra-verisimilitude approach only works for me when it's applied to stories that A. have greater relevance than being real-life events, and B. are more driven by recreating that experience than they are as character studies. This is why "United 93" and "Bloody Sunday" work (I've a fan of the Bourne sequels as well, but that's kind of a different story), and another example would be "All the President's Men", which is similarly more about the process than it is a character study. "Captain Phillips" isn't covering an inherently notable event (could make a great thriller and something more incisive w/r/t the economic systems, but greater political relevance isn't handled well, as I've said), and it's also trying to be a character study at the same time, which doesn't totally work. Hanks kills that last scene, but it kind of feels like it's part of a different movie for me, one that's more about people than process. The half-and-half thing makes it unfocused, which is weird considering that it has the appearance of the same intense focus that Greengrass's previous films have. Still competently made and entertaining enough, but kind of a white elephant as far as I'm concerned. I'm still not convinced the movie ever critiques capitalism or American ideology or critically evaluates its own racial politics. I'd love to discuss it with you though (I'll check your site for your review). One of my central issues is the parallel with Birth of a Nation: the scenes especially towards the end make heroes of the white military saving the poor white man from the evil black pirates. I could see this problem being resolved however if you can convince me that the pirates are ever sympathetic. I just can't find a scene where this is the case. We get background shots in Somalia, but Muse is established as inherently violent with the opening shot of the AK47 pointed at his head. We get the information that they're fisherman, but they're blamed for not pursuing that career avidly enough instead of looking at how their civil war makes it impossible. I think either you look at the movie without its connection to reality and we have to wonder why we need more black antagonists or you look at the movie with its connection to reality and we have only one side of the story. But maybe I'm wrong. I think your analysis of Greengrass's filmmaking is spot-on. Couldn't agree more the last scene with Hanks feels like it's from another movie (almost reminds me of Cast Away). Your description of the movie as "competently made" is exactly correct I think, which is part of why I'm confused at its Best Picture nomination. As far as animal idioms go, I'd say this feels kind of like a one-trick pony: it creates a sense of tension derived from being trapped out at sea with a group of violent pirates, but doesn't really do anything else.